Bacon is a great way to start any Saturday. Add fried potatoes and onions, and you’ll have everyone up and at the table before the coffee is brewed! 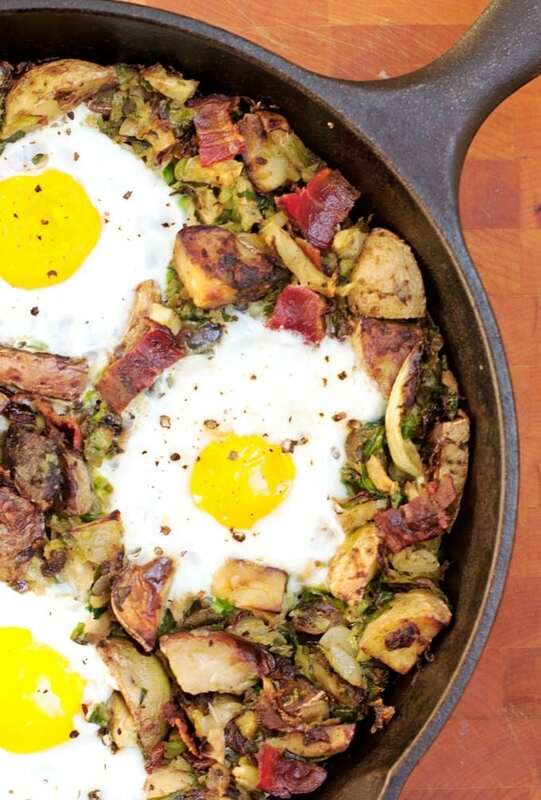 I like to sauté the bacon in the same pan I’ll be using for the potatoes – it lets you add some extra bacon-y goodness to your potatoes 🙂 After cooking the bacon, removing, and draining most of the oil, start by cooking the diced potatoes in the cast iron skillet on medium-low, stirring occasionally. The potatoes will take the longest to cook, so we’ll cook them separately first to make sure they turn out tender and delicious. While the potatoes are cooking is a good time to chop the onion. After the potatoes are fully cooked, add the onions to the skillet, a little salt and pepper, and continue to cook. I used pre-shredded Brussels sprouts for this recipe. Because it’s Saturday morning. If you’re feeling ambitious, you can definitely cut up your own, just trim off the stems, halve, and finely chop. Once the onions are browned, add the Brussels sprouts to the skillet and cook just a little longer until the sprouts turn tender. If you are a fan of my Sweet Potato Hash, you can probably guess that this goes great with a runny egg. 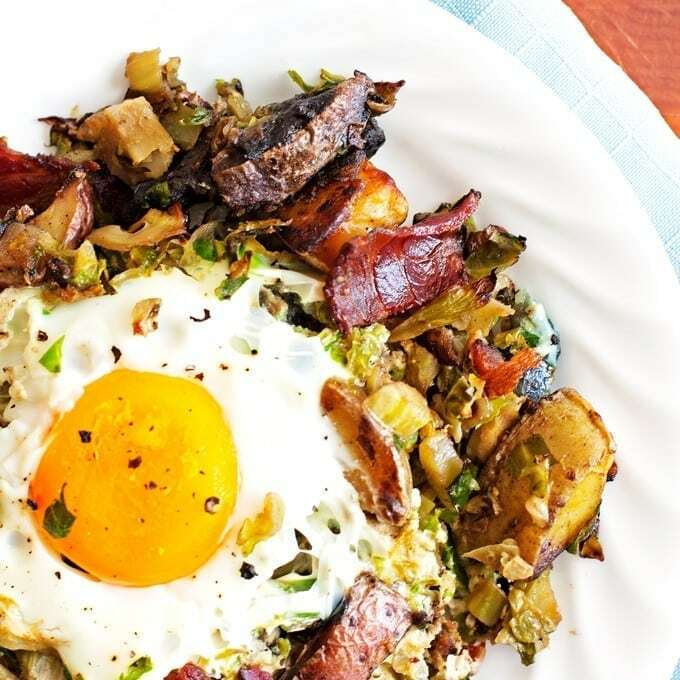 You can create little nests in the hash, add your egg, cover and cook until done or you can poached or fry an egg separately and add it to the hash after it’s cooked – either way will be delicious! Sprinkle with salt and pepper. Brunch is served! 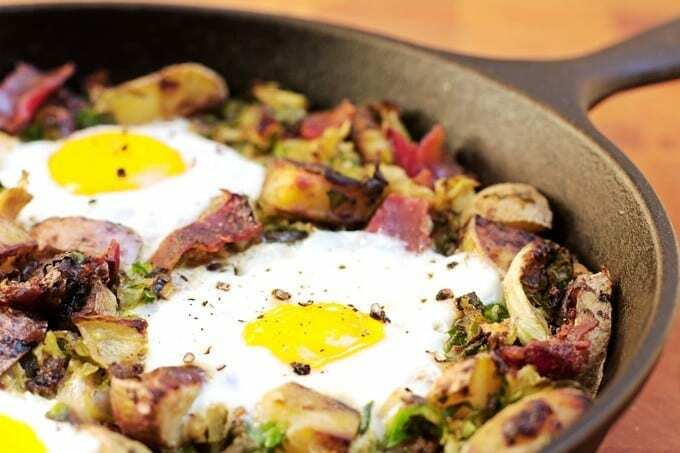 Bacon, Brussels sprouts, and potato hash - a fun, foodie twist on classic corned beef hash. 1 ½ pounds of potatoes diced into bite-size pieces (about ½ inch cubes). Cut bacon in ½ inch pieces. Sauté on medium-low until fully cooked, about 10 minutes. 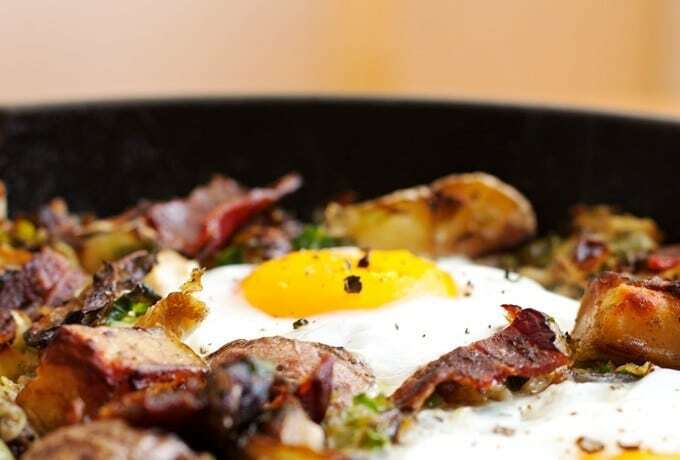 Remove bacon from skillet and place on paper towel lined dish. Drain most of bacon oil from pan, keeping about 1 tablespoon in the pan. Add potatoes to skillet, and sprinkle with salt and pepper. Sauté until fully cooked, golden brown, and tender, stirring occasionally for about 15 minutes. Add onion to skillet, and continue to cook until soft, about 5 minutes. Stir in Brussels sprouts. Cook until tender, stirring frequently, about 2-5 minutes, depending on size. My pre-shredded sprouts only needed a couple of minutes. Turn burner on low. Make small pockets in the hash to fit the eggs in. Carefully crack an egg into each pocket. Cover and let cook until eggs are set. Add additional salt and pepper to taste. Brunch is served!